Carefully selected shrubs and conifers provide food and shelter to a variety of birds, and improve the micro-climate for more tender plants. 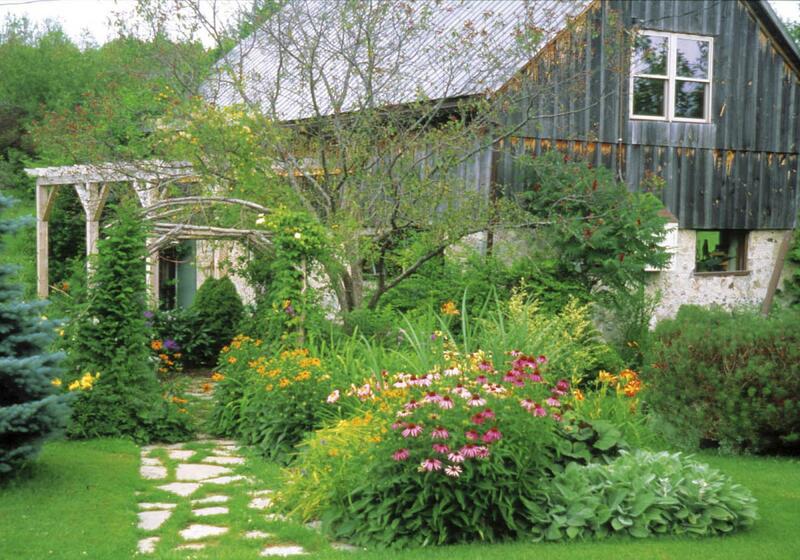 A guide to the rural gardens of Grey and Bruce Counties in Ontario encouraged me to visit Grange Hollow Farm. The brief description included the enticing words 'century farm in the heart of Amish country,' and promised a barn, pond, pergolas, as well as a retail greenhouse with an extensive selection of plants. Located a short drive from Owen Sound in Desero, Grange Hollow is nestled in a hollow created when glacial ice retreated and left a ridge of limestone gravel. From the country road on the ridge you have a lovely panoramic view of the century home and gardens. A tree-lined gravel drive welcomes visitors to the Taylor home. Kathleen Taylor, resident gardener and unusual plant aficionado, is our guide for the visit. The red brick cottage was built around 1875, and features yellow brick trim around the windows. The original bricks have a very smooth, almost satiny finish, and were locally made, according to Taylor. The homesteader's log cabin (pre-dating the cottage) is still visible along the back of the house. The Taylors made several improvements over the 30 years they have called Grange Hollow their home. These include a spacious addition, covered veranda, bell-shaped roof and white gingerbread trim in a vintage design. "The original owners were most likely Scottish settlers. This was a humble dwelling, not a fancy house, but rather a working farmer's cottage. Most likely there were few gardens surrounding the house in 1875, perhaps the odd lilac, currant bushes and a small orchard of apples and pears." The soil in the area is poor, primarily clay pockets on gravel, with lots of rocks. The Taylors were attracted to this site back in the early 1970s. The young couple wanted to live in the country: "We are not city people and this property seemed to feel right." At that time, hay fields stretched up to the front door and fruit trees dotted the property. Today, nearly two acres of display gardens, meadows and a stand of white pines surround the home. The site presented many challenges, primarily because of the poor soil and few flat areas, the land had to be terraced before gardens could be installed. The fields are edged in dry limestone walls, some wide enough to walk on, a monument to the great effort required to clear the fields of stone. Taylor described the grants offered by the government in the mid-70s that encouraged farmers to plough the rock fences under, to increase the workable size of the fields. "The fields are small and not accessible to modern farm equipment, they are not efficient by today's standards." Taylor's husband built a delightful stone retaining wall and then back-filled the bed with soil and lots of rotted manure to create a large, flat bed for vegetables. Today, vegetables mingle with colonies of self-seeding annuals such as mallow, love-in-a-mist and borage in a truly old-fashioned cottage garden. Located between the house and the greenhouse, half of the bed overflows with a vibrant mix of perennials including Crocosmia 'Lucifer', Echinacea purpurea, sea holly (Limonium suworowii), along with the dramatic foliage of Canna 'Tropicana' under-planted with citrus shades of marigolds. The gardens at Grange Hollow offer many striking and thoughtful combinations of hard and soft landscape elements (above and below). Water is conserved by mulching with wood chips and recycled cardboard, and careful plant selection. Here, drought tolerant Echinacea purpurea and Limonium suworowii combine with beautiful, early flowering summer bulb, Crocosmia 'Lucifer'. The farm is serviced by a well and the Taylors are lucky to have a good supply of water. "The greenhouse uses a lot of water, so I try to conserve by not watering the gardens; new plants and trees are the exceptions." In an effort to preserve moisture, gardens are mulched with bark chips from a nearby mill and recycled cardboard (topped with mulch) lines the rows in the large vegetable garden. Taylor says there are many benefits to a garden in the country. "Most people cannot believe how quiet it is here when they come to stay." A testament to a simpler lifestyle is the hitching post in the parking area. Amish patrons can hitch their wagons when they visit. Taylor planted groups of shrubs, primarily viburnums and conifers, to offer shelter and a food source to visiting birds such as red-bellied woodpeckers, sharp-shinned hawks, hummingbirds, orioles and waxwings. The Taylors also planted 10,000 white pine seedlings - the towering trees have helped divert wind and improve the valley's microclimate. The home was built in a depression on the land and Taylor laments, "naturally, it is the first place frost seems to settle in the fall and the last place it lifts from in the spring." Taylor operates a garden centre on the farm specializing in unusual perennials and annuals. "We do not want to be toe-to-toe with Wal-Mart. Our clients like to try new, unusual things." Visitors are inspired by unusual and artfully combined perennials such as daylilies with purple-red throats, echoing the purple stems of mugwort (Artemesia lactiflora 'Guizho'). Once a week, the Taylors fill the farm vehicles (and family car) with trays of plants to sell at the weekly 'Keady Market.' "This is a large, true farmer's market - no stores, everyone sells from the back of their trucks. It runs every Tuesday all summer and is very popular with both tourists and locals." Containers and hanging baskets are a specialty, along with unusual perennials and annuals, rockery plants, tomatoes (29 varieties, including many heirloom varieties). "Tomatoes are sold in individual pots; our clients grow only a few tomatoes and like to try several different varieties." Popular perennials include hellebores, Cimicifuga 'Black Negligee', Heuchera 'Amber Waves' (which sold out very quickly), Heuchera 'Lime Rickey', daylilies and ornamental grasses. On the subject of annuals, Taylor noted that Cerinthe (honeywort) is an annual that is underused. Cerinthe major purpuescens offers bluegreen foliage and a floppy habit that works great in a large container, trailing over the edge. Small clusters of violet-purple tubular nodding flowers feature gentle cream-coloured insides. Another favourite is Malva sylvestris ssp. mauritian 'Bibor Felho', which offers tall stalks of wavy trumpets in brilliant shades of violet with deep purple veining. Rockery plants are another specialty. Customers from Sauble Beach (who garden on sand) find the selection of rockery plants ideal. Taylor considers the pasqueflower (Pulsatilla vulgaris) another plant that should be used more often. "It blooms in April, when not much else is happening perennial-wise," she notes. "They thrive in well-drained soil and are relatively drought tolerant and good for naturalizing." Saxifrages are also among her favourites for the rock garden. Their remote location has not proved to be a disadvantage. "Many gardeners make a visit to the garden centre an outing for purchasing plants," notes Taylor. This is not surprising, given the appetite many gardeners share for discovering quaint, out-of-the-way garden centres. Grange Hollow encourages customers to explore the display gardens among the historic buildings in the secluded valley setting. They can easily imagine themselves visiting a 19th century garden, a delightful escape and educational experience. Theresa Forte is a columnist, photographer and garden consultant based in Niagara Falls, Ont.